Leicester City Council has successfully bid for £100,000 from Historic England towards a new grant scheme aimed at reparing and enhancing historic buildings along the busy shopping street. The city council will also provide funding of £100,000. The city council will work with property owners to identify essential repairs and restoration projects that will make ground floor shopfronts better relate to the architectural detailing of the buildings above and help enhance the historic environment of the street. The grant scheme is part of Historic England’s Partnership Schemes in Conservation Areas (PSiCA) programme, and property owners can apply for grants to cover up to 75 per cent of restoration costs. Church Gate was designated as a conservation area in 2006, but was assessed as being ‘at risk’ in the Historic England Heritage at Risk Register 2018. Clive Fletcher, principal historic places advisor at Historic England, said: “Our research has shown that by investing in old buildings we can reverse decline in our town and city centres. 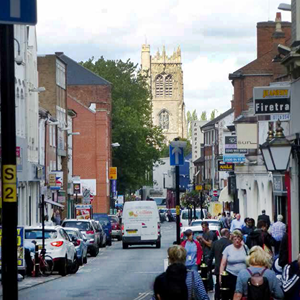 “We are delighted therefore to partner Leicester City Council in this project for Church Gate, a conservation area recently assessed as being ‘at risk’. Cllr Adam Clarke, deputy city mayor and the city council’s heritage champion, said: “I am really pleased that we are working in partnership with Historic England on this scheme to help restore and preserve the architectural heritage of the Church Gate conservation area. “It’s a fascinating part of the rich history of our city centre and that deserves to be celebrated. “We have an excellent record of working with Historic England to help ensure we continue to meet our responsibility to protect, retain and enhance Leicester’s architectural heritage for future generations.